Two rallies outside Seattle City Hall on Saturday were “peaceful but loud,” as three people were arrested, but protesters mostly just hurled insults and taunts. 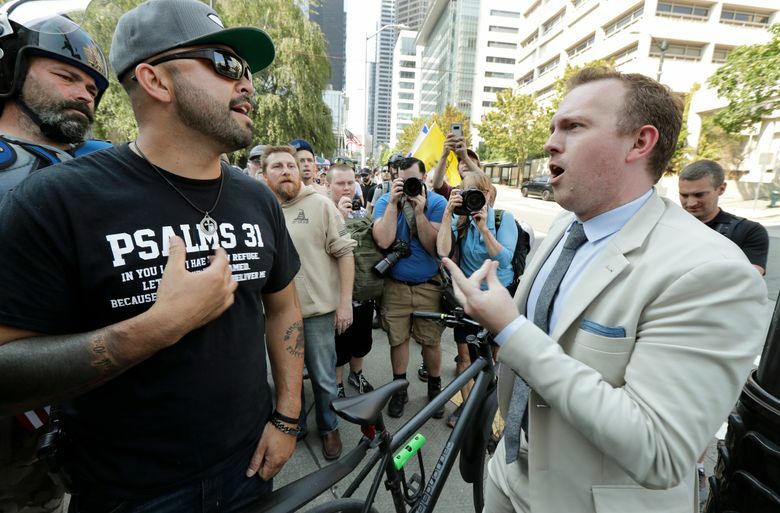 Dueling rallies outside Seattle City Hall remained largely peaceful Saturday afternoon, even as heavily armed right-wing protesters traded verbal barbs with bandanna-clad anti-fascist protesters across the street. The two groups were separated by metal barricades along Fourth Avenue and a sea of Seattle police officers, many of them on bicycles. Three men were arrested, all for misdemeanor assault, said Sgt. Sean Whitcomb, a Seattle police spokesman. At one point, a scuffle broke out on the corner of Cherry Street and Fourth Avenue. A man dressed in black, with a black bandanna, was taken away in handcuffs. A man in a red Donald Trump hat knelt on the street, bleeding from his forehead. The “Liberty or Death” rally was initially organized by two right-wing groups, Washington Three Percenters and Patriot Prayer, intended as a gun-rights rally. It drew about 150 people. The counterprotest, led by Organized Workers for Labor Solidarity, Radical Women and the Freedom Socialist Party, drew two to three times as many people. Many right-wing protesters openly carried guns — mainly handguns, but also rifles — wore body armor, padded gloves and ear pieces, and carried spare magazines and other tactical gear. A half-dozen wore black polo shirts, trimmed with yellow, which has become the unofficial uniform of the far-right Proud Boys, which the Southern Poverty Law Center lists as a hate group. “I’m not saying extreme nationalism or anything, but that’s the opposite of everything we want,” Lassley said, pointing across the street to the counter-rally, which he said his sister was a part of. Many counterprotesters covered their faces with bandannas and wore T-shirts or stickers declaring “I am an anti fascist.” Several counterprotesters carried guns themselves, wearing T-shirts for the Puget Sound John Brown Gun Club.